We've struggled a lot with Latin in this house. It is something that we feel is very important to learn, yet getting the right mix of how to learn it has been a challenge. When I had the chance to express interest in the Classical Academic Press Latin materials, I was torn. Do I have Connor use Latin Alive, meant for grades 7 and up (more on that later)? Do I go for Song School Latin, meant for K-3rd grades, and have Richard and Trina get started? (Umm, I ended up buying a dented and damaged copy so I could!) Or do I go with Latin for Children, which is intended for third grade and up, and have William and Thomas do it? I finally opted for Latin Alive, and we are loving it. What I received to review is the Latin Alive Bundle, which includes a student book, a teacher book, and a DVD/CD set including 7 DVDs (with over 15 hours of instruction) and one audio CD that includes the Unit Readings. This set sells for $139.95, but you can just purchase individual pieces. For my house, I cannot imagine doing this without the DVDs, and I think they are well worth the price. For my future high school Latin students, I will only need a new student book for about $25 each. That is a bargain. At this point, we are nearly through Chapter 6, which is the last chapter in the first unit. The next lesson is the Unit 1 Reading -- sort of a review chapter for the first unit. I had really hoped we would get that far, but we just did not have enough time. Let me walk you through our work with Chapter 6. Connor grabs his workbook and the DVD. Mrs. Moore introduces the chapter by talking about the state motto for Arizone (Ditat Deus) and then goes through the vocabulary. In this chapter, there are 13 second declension nouns (the first time we've seen 2nd declension) and five verbs. The magistra goes over the pronunciation, meaning and derivatives, and makes comments about the words to help the student to remember. The DVD is then paused while Connor works out Exercise 1 -- writing out the syllables and accents for the vocabulary words. The DVD section is about six minutes. This is how the remainder of the DVD goes as well. Connor watches about five minutes of Mrs. Moore, and then he does an exercise. These exercises involve indentifying stems for the nouns in the vocabulary list, writing out declensions for three masculine nouns, writing out declensions for two neuter nouns, and finding indirect objects in English sentences and translating just that indirect object into Latin. In the last couple of exercises, the pattern changes and he watches a few minutes of explanation, does the exercise, then comes back to watch a few more minutes of talking about all or some of the exercise answers. The sixth section deals with more grammar, this time "dative of reference." This section is longer, and Connor had to really think on the exercise, which involved taking six sentences, circling endings, parsing, diagramming and finally translating. I loved this. He couldn't just guess, he couldn't bluff his way through. To complete the exercise, he really did need to understand what he was doing. The final exercise for the chapter has him going back through the sentences from exercise six and determining which use Dative of Reference and which use indirect objects. We choose to split this section up over usually three days, with him going onto Headventureland daily and using their Flash Dash to review vocabulary. a Latin in Science section where they talk about tree names and why they are feminine even though they are second declension nouns. Just a note -- this explanation does get into a bit of mythology, which I think is great, as I would never remember that trees are feminine without the discussion about the Roman's beliefs in Dryads to help that fact stick. This section also has a suggested activity involving a nature walk and finding the Latin names for indigenous trees. The above sections (except the chapter readings which start in chapter 4) are not all present in each lesson, and some of the lessons also have a Derivative Detective section. Following all of this, Connor spends some more time playing on Headventureland and otherwise reviewing the chapter. One disappointment I have with the program is that there isn't a lot available on Headventureland for Latin Alive. There is a lot available for Latin for Children, and Connor has worked through those to find ones that are appropriate for him as well. He has found quite a few. His favorite is the Chart Challenge Game. We have not yet done a Unit Reading chapter, but that is what is coming next. Looking it over, I like what I see. The readings are adapted from Livy. In looking over the first reading, it starts off with an English reading on the descendants of Aeneas and an English family tree essentially tracing from Priam (king of Troy) down to Romulus and Remus. Then comes the actual Latin reading -- which starts off with an English title and a list of characters explained in English. The Latin reading in this case is only two paragraphs, and the student is supposed to start by just reading it through without trying to translate it. Then the student should go read the questions about the text to help to know what they are looking for. These questions are of the same type that a student would encounter on the AP Latin exam, or on the National Latin Exam. I love that. At that point, the student should go back to re-read the Latin selection, using the glossary provided as necessary, and then start answering the questions. I am very impressed. 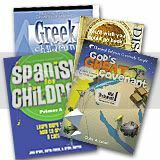 This review chapter also includes a Culture Corner reading on relatives and an activity to create your own family tree. Unfortunately for my kids, they would have a hard time using most of this vocabulary on their own family, since they don't have paternal aunts or uncles, nor do they have maternal aunts, nor do they have any cousins at all. The teacher book includes the full student text, with pages numbered as they are in the student book. The teacher's version also includes teaching suggestions in black boxes to help me get through the material. After the numbered student pages, there are un-numbered teacher's pages that contain the answers to all of the exercises. An additional note: we didn't notice it in earlier chapters (which may be because it involved words we already knew from previous Latin studies) but in Chapter 6 there were a couple of words used in the exercises that were not part of the vocabulary in this book and we needed to look them up in a Latin dictionary. This format is really working well for us. We have been doing this together, although Connor could easily do this independently. Instead of one big lecture per lesson, he is getting a series of little ones, with plenty of exercises in between. I wish we had the option to use Ecclesiastical pronunciation at this level, but pronunciation is not something I get too hung up on. I love that we can move through at a pace that works for us, and re-watch the DVD as often as necessary. One thing I'd like to comment on, though, is the age ranges given for this product. They say it is for 7th grade and up. I think that for a student who has previous Latin experience with a comprehensive upper elementary level program that statement is probably true. Latin Alive starts at the beginning, so the first chapters may be pretty much review. But if I had a 7th grader with no previous Latin experience, and especially if I had little or no Latin experience, I think Latin Alive would move too fast and not be "fun" enough. If I were starting a 7th or 8th grader with Latin, I think I would give serious thought to working through Latin for Children at an accelerated pace. Maybe do all three levels in two years and then move to Latin Alive. I believe Latin Alive is supposed to end up as a three year program (we will be purchasing Latin Alive 2 for next year), and doing Latin for Children in 8th and 9th grades would still leave time for all of Latin Alive in grades 10-12. As you can see in the picture, Classical Academic Press has a number of other products. There are Latin programs for younger students (and Latin Alive 2! ), Greek programs, Spanish programs, a Bible program that is intriguing, logic, a poetry book that looks amazing... go check them out! Disclaimer: As part of the TOS Homeschool Review Crew, I did receive the Latin Alive from Classical Academic Press. The fact that I received complimentary products does not guarantee a favorable review. It does guarantee a review. A fair review. But I am not going to praise something unless I think it deserves the praise. If I don't like it, you'll hear that. And hopefully with enough detail as to why so you can decide for yourself if what I hate about it makes it perfect for your family. For more about my take on reviews, visit my blog post here. I'm with you about the age levels. In fact, because I was trying to keep two students together, I actually had a ninth grader in Latin for Children C two years ago. I'm glad I chose that route, rather than bumping him to Latin Alive! before he finished the primers. That son is now in Latin Alive! Book 2, and doing just fine. I am, of course, thinking high school credits as I read your review (that's pretty much what I am thinking 24/7 these days). So, would you consider this credit worthy for a freshman? Anyway, I am kind of getting into it now, but I want to make sure I choose a curriculum that would really be credit worthy as a foreign language before jumping in with the big bucks. What are your thoughts along those lines? I thought I commented, and then I think my comment just disappeared. So, just in case it is lost in internet land -- I am considering Latin for my soon to be freshman and wondered if you would consider this program adequate for a foreign language credit. He really wants a language that he doesn't have to roll 'r's and such. What are your thoughts as far as the weight this would carry for credits? A great review (glad you had time to rewrite what you thought was a bad first attempt)!! We are using one of the Bible books this year - the Old Testament, book 2. It is really good! But it might just be a little to low on the age thing too - I have a first and third grader (6 & 8 yr olds) doing it, and some is over their heads. Lauren -- I'm telling you, this truly was 1000% better than what I had before. I am going to have to pick your brain about the Bible material. I'm thinking I want something for a couple of mine too, but am guessing that having the K & 2nd grader do it next fall is probably not going to be a good fit. I thought about getting it for the 5th grader... I gotta get over to Mardel and look at it seriously. Wow, Debra! I can't believe that was a "Rewrite!" I love how you "Walked through" a lesson. Purple Squirrel -- that is great to hear. And I did not make that clear in my review... I think 7th grade is going to be too difficult for most students. 8th grade I think is borderline. Technically, that's what Connor is right now, but he has had a bunch of Latin before. I think a motivated 8th grader would be find even without a lot of previous Latin. Thanks for all the details! After knowing how much I love LfC and hearing all about Latin Alive, I can see us using it for Addison's high school work. I also believe Latin Alive is not for students below high school age for several reasons. It is written at a very high level, assumes quite a lot of grammatical knowledge, and moves at a very fast pace. My daughter started Latin in 6th grade and we used Latin for Children, so she did LFC A,B,C in grades 6,7,8. We started Latin Alive in 9th grade, and she is currently in 10th grade and working through book 2. LA is DEFINITELY worthy of at least one high school credit per year. I have a friend whose daughter takes Latin in a local public high school and they hardly work on anything besides cultural projects. LA is comprehensive and very challenging. My daughter does very well with it; I on the other hand, have a graduate degree, taught at the college level, and overall consider myself to be very well educated. I find LA to be very difficult! Last year I noticed CAP actually was using the LA program over four years; this year, they are back to one book per year. I am curious to see if that lasts, because once you get to LA2, it seems to be a bit too much for one academic year.